In 2011, to mark 9/11, I wrote a blog post entitled Green Security: The U.S. Military Fights Climate Change and Declares War on Fossil Fuels. When I was researching the military's passionate effort to embrace renewable energy and sustainable operations, I was thrilled. Thrilled, not only because I knew military investment in renewable technology would help kick-start mainstream adoption of clean technology, but, also, because here was a strong argument, finally, that renewable energy naysayers and climate change skeptics might actually listen to. If the red, white, and blue armed forces are going green and seriously worried about climate change, well then, maybe global warming and the whole "green thing" is not just some liberal conspiracy or eco nonsense from left wing environmentalists. Energy Bulletin's "The Real Reason the Military is Going Green" reported that the Department of Defense first acknowledged climate change as a factor in its operations in a 2010 report in the Quadrennial Defense Review. The report stated: “Climate change may act as an accelerant of instability or conflict, placing a burden to respond on civilian institutions and militaries around the world." The excellent Energy Bulletin piece featured retired Brigadier General Steven Anderson who calls himself “an accidental environmentalist.” His epiphany about climate change began with a tactical problem in Iraq. The Brigadier General coordinated the transport of millions of gallons of fuel across Iraq to power everything from vehicles to the large compressors used to cool individual tents. He was taking one casualty for every 24 fuel convoys, and he was conducting 18 convoys a day. That’s one casualty every other day. He needed to get the trucks off the road. 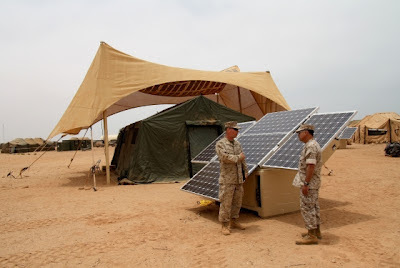 He needed to find a way to reduce the military’s fuel use and integrate solar PV and other alternative power sources into his base of operation. Granted, the initial thrust of the military going green might have been to protect soldiers, not to save the environment. But, saving lives is, ultimately, what saving the environment is all about. Why should our own soldiers risk their lives because they have to haul barrels of oil around hostile territory when there are safer, cleaner ways to power their operations? The thought of not questioning the paradigm is as illogical as it is idiotic. In U.S. Military's Green Energy Criticized By Congress, NPR reported the White House and military brass are calling for the development of alternative energy. One goal is cutting dependence on foreign sources. Another is reducing the carbon footprint of the largest fossil fuel consumer in the world. There are more and more people in the private sector who get that going green by implementing use of alternative fuels, renewable technology and taking action to mitigate climate change is as much about security as saving the environment. This includes Alex Wilson, founder of BuildingGreen, who recently launched the Resilient Design Institute to study ways to make our homes and communities more resilient and better prepared for natural disasters and potential disruptions in energy and food supplies in the future. But, some on Capitol Hill are blocking the military's efforts to develop a green program. The NPR host, Audie Cornish, said: "Now, one of the program's biggest critics is Senator John McCain. He argues that the President is using the military to pursue a green agenda." What is wrong Senator McCain with the President of the United States of America, our Commander in Chief, helping the military to save soldiers' lives, reduce security threats, all the while pursuing an environmentally friendly, green agenda which the military itself was already embracing wholeheartedly? Now is the time to be proud of the Red, White, Blue AND Green.